Even the Chinese character expresses SPRING, being composed of a tree on the left side and the character for spring on the right. This flower, which grows almost like a weed everywhere, has already been sung about in the Manyoo-Shuu 万葉集 poetry collection. The fallen halfopen flowers (ochitsubaki) are quite a sight under a large tree. On the way to our local temple they look like a red carpet layed out for the gods to tread. Another name is "Sazanka" 山茶花、literally meaning the flower of the mountain tea plant. ''Camellia Sasanqua'' in Latin. This is a kigo for winter, see below. The Camellia japonicas bloom in early spring. The sasanquas bloom in fall and grow in the mountain area of the west side region in Japan. This species is made up of a large number of varieties (running into the hundreds) and colors. The japonicas do not smell, but some sasanqua smells. 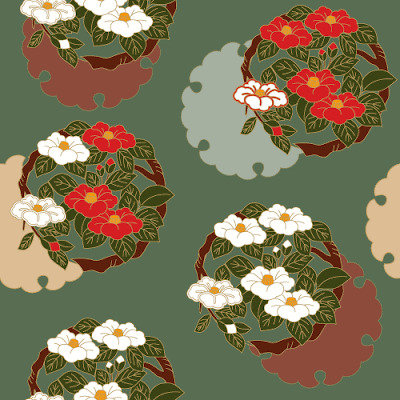 In general, it is said that the japonica's blooms drop, but the sasanqua's blooms shatter. 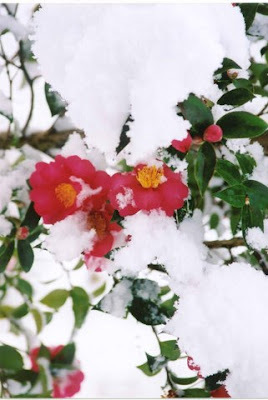 A great link with many pictures of Japanese camellia, in English. Famous products made of tsubaki are oil preparations for your skin or for cooking. Camellias are evergreen shrubs, bloom in autumn and winter, and very popular because of their great beauty because of their flowers, form and also foliage. They grow in a habit form, have glossy leaves and exquisitve form. Most Camellias at first were imported from Europe but now are grown in gardens from southeastern Virginia thru the Carolinas to Florida an along the Gulf Coast and even along the Pacific coast. They can also be grown in the house or outside. D er Camelienbaum kam im Jahre 1739 von Japan nach Pillnitz. Stammumfang 150 cm. Höhe 7 m. Sein Unterhalt kostet jährlich ca. 800 M.
This famous tree is said to have been a gift from Japan. When I saw it a few years ago, it was inside a huge hothouse (for an enormous amount of money) and is treated like royalty itself. One day a monk asked Onitsura about the essence of haiku. all in white . . . The cut marker KANA is at the end of line 3.
. Ueshima Onitsura 上島鬼貫 . hi no me o miru 日の目を見る fig. "see the light of day"
Planting camellias from a cut branch is best done during the rainy season. from the フタバガキ family of plants. At Oshima Island, the local children picking up the camellia nuts. Later, oil is pressed from the nuts. The oil tsubaki abura 椿油, is used for cooking or cosmetics. My Sasanka tree is in full bloom now, with early December morning frost doing no harm but enhancing the beauty.
. Tsubaki in Ohaga, January 2006 .
quoted in "Haiku" by R. H. Blyth (Hokuseido Press). ume tsubaki haya-zaki homen Hobi no sato . yoso gokoro, yoso-gokoro ... the heart goes astray . . . This hokku is from Issa's haibun travelog Journal of a Trip in the Third Year of Kansei (Kansei sannen kikou) and was written on lunar 3/29 (May 1) in 1791, while Issa was visiting various poets in the area northeast of the city of Edo, so the shore is the Pacific shore along the eastern coast of Honshu. The people in the area have planted low camellia trees up and down the coast as far as one can see in any direction in order to protect the shore from the encroachment of the ocean and to act as natural protection against high waves. People may have planted pines and other trees as well, but at this time of year it is the the camellias which stand out, since they have all burst into full bloom together. The large bright red and pink blossoms are not being blown down, so it is presumably a lazy but expansive spring day, with the blossoms showing more wavelike undulation and energy than the peaceful waves offshore. The hokku seems to suggest that on this day it is surely the overwhelming beauty and intensity of the endless camellia blossoms that is protecting the shore and keeping the waves small and softly sinuous.